This 1 Carat Emerald-Cut Sapphire Diamond Ring in 14K White Gold is timeless, but never merely ordinary. By pairing the rich blue sparkle of the sapphire with the versatile sparkle of diamonds, this ring displays both striking contrast and enduring beauty. The sophisticated sapphire that draws eyes as the focal point of this feminine style is a gorgeous emerald-cut gem, measuring 7mm high and 5mm wide. Although the chic rectangular shape and sleek lines of the emerald cut have been used since the 15th century, they give this ring a modern flair, with a look that's current but far more than a passing fad. The deep blue sparkle of this one-carat sapphire renders it a striking centerpiece as it's contrasted in glamorous fashion by 0.30 carats of diamonds. On each side of this sapphire is a cluster of three small round diamonds that nestle together as they bookend the center gem. These stones gorgeously contrast the indigo hue of the sapphire with their colorless glimmer, maximizing the saturated blue hue of this gem and making it even more eye-catching. A foundation of gleaming 14K white gold provides the perfect touch of cool shine to this perpetually elegant and feminine ring. 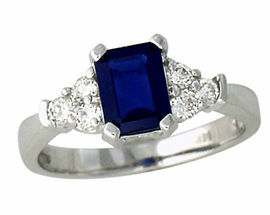 We guarantee our Sapphire and 0.30 Carat Diamond Ring - 14K White Gold to be high quality, authentic jewelry, as described above.